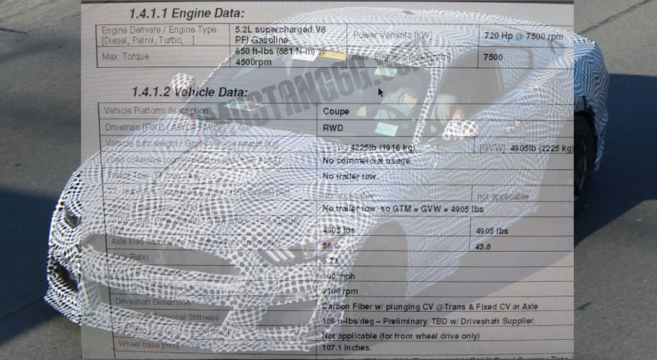 We have what appears to be a leaked document with plausible specs (despite some misspellings) of the 2020 Shelby GT500 Mustang’s power ratings and other specifications. The document aligns with many of the agreed-upon speculation to date, and claims the next-gen GT500 will come with a 5.2-liter supercharged V8 producing 720 horsepower and 650 lb-ft of torque. At the moment it is unclear whether a GT500R or GT500KR version will also be offered, possibly with different power ratings. Other details revealed suggest the vehicle will have a 190 MPH maximum speed, 3.73 axle ratio and have a curb weight of 4,225 pounds. See the full details of the 2020 Shelby GT500 horsepower, torque and specifications leak inside.